I was going through some of my old photos the other day and came across this one. It was taken 40 years ago this month. Wow, how have the years gone by so quickly! 1969 was the year I graduated from college and flight school. It was the year that man first walked on the Moon. It was the year that I missed getting drafted by a high drawing number in the draft lottery - And it was the year that I married Linda -my wife of 40 years. I am in the front of this picture leaning up against my 1966 Alfa Romeo GTV. My brother is in the background sitting on the fender of his 1957 Alfa Sprint Veloce. The picture sure brings back memories. In the weeks ahead I am going to take you on a little road trip and show you some of the cars I have owned over the past 40 years. For some of you it may also be a trip down memory lane. 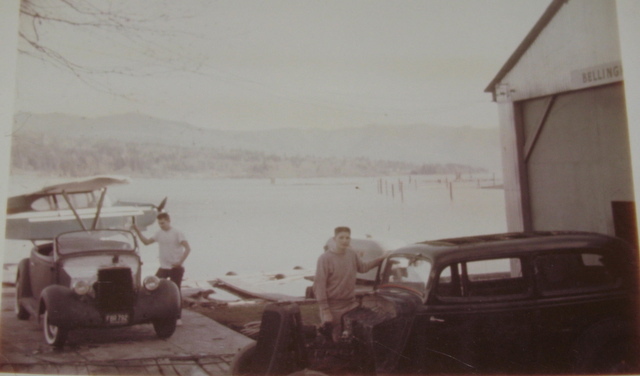 I purchased my very first car exactly ten years earlier (1959). I was thirteen at the time and my older brother convinced me to go buy this 1929 Model A Pickup that he had found for $20.00. Even today I can't believe I didn't even ask my parents permission. We just went over to this delapidated house and pulled the Model A out of the weeds and towed it home. I was fascinated by mechanical things and wanted to understand what made a car work. I decided the best way to do that was to take it apart. I quickly learned about pistons, crankshafts, transmissions, rear differentials, carbs, distributors and tools. I also learned that the sum of individual parts may be worth more than the total. I still remember when an older man stopped by one day and offered me $25.00 for the tail light. As a 13 year old it did not take long for a little light to go off in my head. Within a couple years I was selling old car parts are over the U.S through the then very small publication Hemmings Motor News. Flash forward again to 40 years ago - October 18, 1969. 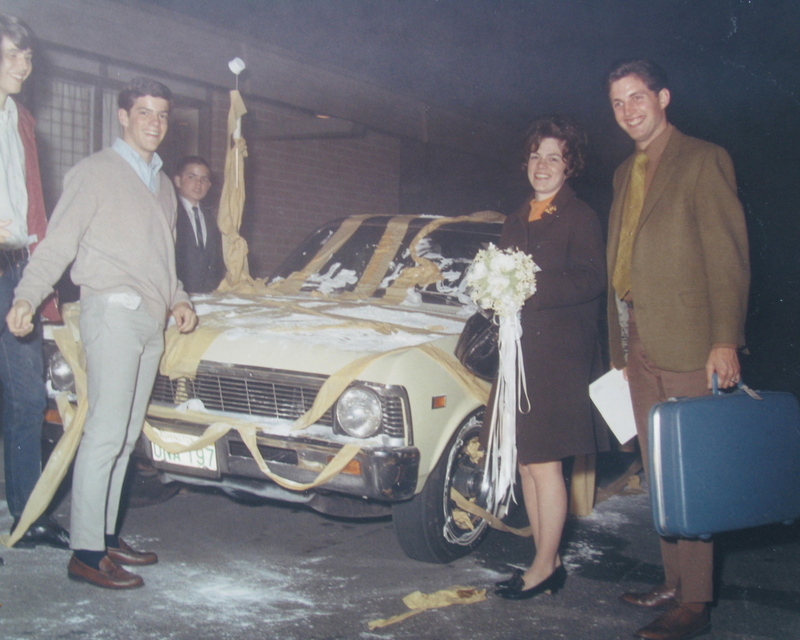 On their wedding night Kent and Linda prepare to make a mad dash in their 1969 Chey Nova get-a-way car. But alas, the cousins dumped a bag of flour on the car! The night was foggy and you can just image what happened as the flour outside turned to glue and the flour in the fresh air vents sprayed in our faces as I hit the road and turned on the defrost to max! We even got pulled over by the State Patrol. It was an unforgettable get-a-way! 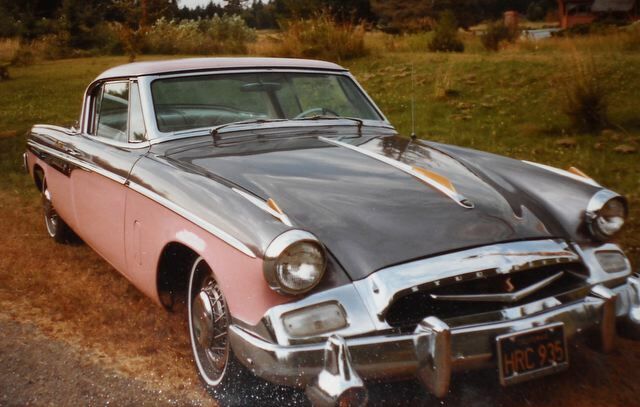 The year was 1983 and I had just finished restoring a rare 1955 Studebaker Speedster. A year later I drove the car from L.A. up to Bellingham in the middle of August without any air conditioning. Now that was a trip! I still remember the bucket of water and a big towel next to me on the front seat. I kept squeezing water over my head to try to keep cool as I cruised up through central California on 1-5. The trip was somewhat uneventful until I was 60 miles from home and I lost all my brakes coming down a freeway offramp. It was sure a good thing that my emergency brake worked! Flash Forward: July 2008. My youngest son, Joel gets married to Kiana on a warm summer day. I would have flown them off into the sunset in the biplane but there was only room for two people! Instead we make the getaway in my 1959 220SE. 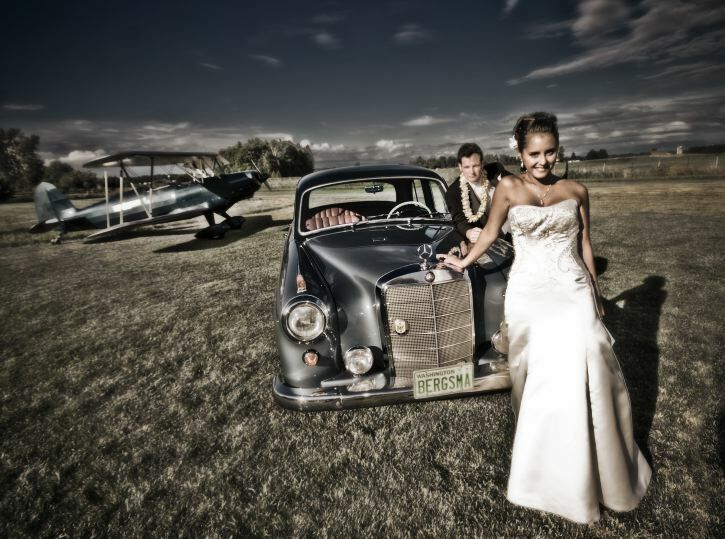 Better know to my kids as the wedding car. July 2009. Our beloved Belvedere makes another successful getaway with cans in tow and Kent at the wheel. This nice original 1959 220SE is a favorite as it looks like a small embassy car with fags flying. 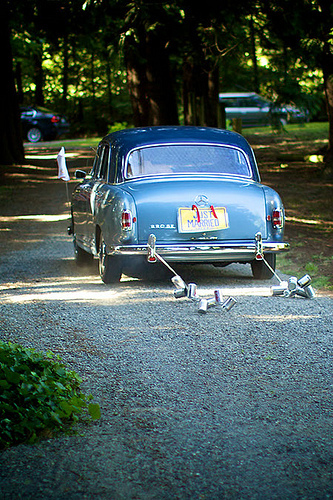 Both my sons used this car in their weddings. Now it is time for one of my son's friends. With an overhead cam fuel injected six clyinder engine this is a great freeway cruiser. And I did not have to restore it. November 2009: Sorry to jump so far ahead but I just could not pass up the chance to "save another one." I just can't seem to rid myself of the desire to rescue a special Mercedes. And so it has happened again. Look what I trailered home on November 22. 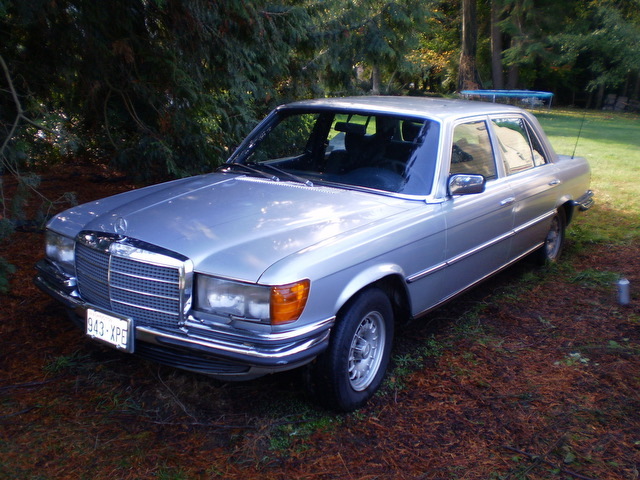 It is a 1978 450SEL 6.9 (European model) with classic Euro bumpers, headlights, and velour interior. This baby has 289 horsepower (39 more than the U.S. version). Absolutely no restrictive smog controls. Came from the factory with heated front and rear seats, power reclining rear seat, ABS brakes, and hydropheumatic suspension. But this one is going to need some CPR before it regains its former glory.